Supragel™ Amorphous wound care hydrogel is available in a 25g tube (sterile). Supragel™ is a newly formulated gel whereby its excellent viscosity maintains the integrity of the gel throughout its use. Depending on wound conditions, Supragel™ has the abilitly to rehydrate dry necrotic tissue plus promoting rapid debridement plus absorbs wound slough and excess exudates. Due to its fully cross linked nature, no maceration occurs. Supragel™ is indicated for use in the management of many different types of wound including: Leg ulcers, pressure sores, cavity wounds, fistulas, post operative wounds, exuding sloughy or necrotic wounds, first & second degree burns. Do not use on patients with a history of sensitivity to gel or any of its components. Do not use on third degree burns. For topical use only. For single use only. Wounds that show signs of infection maybe dressed with Supragel™ under the supervision of a medical physician or specialist nurse in conjunction with a systemic antibiotic treatment program. 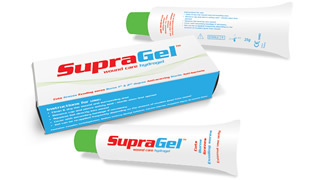 There are no known contraindications to the use of Supragel™ as a topical wound dressing. Supragel™ is supplied sterile in a tube delivery system. Use only if protective pouch or seal is not opened, damaged or broken. Do not resterilize. DMC Medical Limited is ISO 13485:2003 + AC:2007 approved. Method of use: Supragel™ is simple to apply and is supplied sterile in a tube delivery system. The wound should be cleaned prior to gel application. Please refer to the instructions for use (IFU) that is enclosed with the syringe or tube.